Get a full-service property management firm with pet-friendly rental properties in Omaha Nebraska, including service dogs. The tasks that service dogs perform for the benefit of the physically disabled people are outstanding. 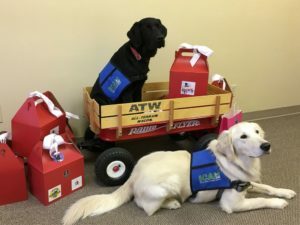 These trained assistance dogs work magnificently with people who have balance problems, use wheelchairs, have psychiatric disabilities, need seizure alert, and have different types of autism. Service dogs enhance a person’s mobility and independence by performing tasks such as opening doors, pull a wheelchair, picking up small objects and turning the light switch on/off, and other forms of help the disabled person may need. We are the leading Omaha Property Management company with a large portfolio of pet-friendly rental properties in Omaha. Because service dogs are specifically trained to help its disabled owner, they have the legal right live in housing even if other pets are not allowed. You can call Real Property Management Heartland/Omaha Plus and find out more information about Service Dogs and Rental Property in Omaha Nebraska , we can help! Our rental properties are specifically designed to accommodate service dogs so that they can provide you with assistance and aid with ease. We even go further to waiver normal pet fees on service dogs for all the rental properties we manage. Our pet-friendly apartments for rent are situated in great locations and equipped with amazing utilities to give you the ultimate living experience. Whether you’re looking for a condo, apartment, townhome, duplex or a house, RPM Heartland/Omaha Plus is your best choice or rentals in Omaha and surrounding areas. Experience peace and tranquility at pet-friendly apartments in Omaha that gives your service dogs freedom to go anywhere with you and live freely. Find out more by calling our office today at (402) 884-4428 and ask about Service Dogs and Rental Property in Omaha Nebraska.